Hey everyone, read about our whole trip by clicking on the Trip Log below. It's super fancy and organized for each day. Or check out our final video and have a look around the site. Yup, we made it. Capitol number 50 on day 50. We spent Monday around Los Angeles looking for different ways to get to Hawaii, but it was the guys from Fermata who came through and saved our dignity with only hours to spare. They organized a big party at Carpe DM, a bar in Simi Valley, just north of Los Angeles for us and arranged a percentage of the proceeds to buy us tickets to Honolulu. It was about 1:00AM when they counted the money earned, called the airlines and booked us two return tickets to Hawaii, leaving at 8:45 AM from LAX. We celebrated late into the night with everyone at the party, knowing we were gonna accomplish our goal. Presuming we didn’t miss another flight. Thankfully, this time we didn’t miss the flight. Traffic on the 405 in LA this morning had other ideas, but we managed to get on the plane with about 10 minutes to spare and took off for Hawaii. Miho from the Waikiki Grand Hotel hooked us up with some rooms for us, the Golden Ticket winners, our friends and families. And Platinum Limousines set us up with a ride from the Airport to the capitol. Mary-Rachel, Kim, her husband Jay, Teresa and Lisa joined us at the capitol building for our final jump shots of the project and that was it. So there you have it, Hitch 50 is complete. Thanks to the kindness of hundreds of strangers throughout North America we accomplished our goal today. First off, thank you to all 116 rides from Times Square to Honolulu. From cars to airplanes, trains to semi-trucks, boats to bikes, it’s the rides, and the people giving them which made Hitch 50 happen. Our shortest ride was Nathan in Atlanta, who set us up with an interview on CNN and our longest was Chris who drove from Houston through Austin to Oklahoma City. The point here is that all the rides are equally important, diverse and memorable. Thank you to everyone who put their lives on hold, took the day off work and welcomed us into your lives. Often welcoming us into your lives involved driving a few hundred miles in one direction to drop us off and drive back, alone on the same road. This is one of the things that amazes us most, how people will go long out of their way to help a stranger accomplish a goal. For this we thank everyone of you. Another thank you to everyone who welcomed us into their homes. From mansions to college dorms, swanky urban lofts to trailer parks, tropical resorts to ice cream trucks, we’ve seen the diversity and cultural differences from every corner of the country. Staying in homes, meeting the people and living their lives is how we really got to know the people of America and what makes them unique. These experiences are definitely highlights of the trip and we hope to reciprocate the hospitality to all of you in the future. We’ve spent the last 1200 hours traveling almost 24,000 miles, through 50 states, 3 countries and five time zones, our average speed for the past 50 days is just under 20 MPH. It seems like 1100 of these hours were spent talking with the people of America and hearing their stories. We never planned for this to be a sociology project, but as it evolved and as we began to see the differences and similarities of Americans the true underlie of America became clear. Political, religious and philosophical beliefs very from every region, but nothing is diverse as opinions on where the Mason Dixon line is. Really, we had 14 unique answers. Still not exactly sure of the correct one either. The friendly rivalries between states, cities and colleges was always amusing to hear, and while people are different everywhere the common themes of kindness and unity are apparent in every corner of the country, but more than anything Americans are proud, and for good reason. The cultural and geographical diversity and beauty of this country is not matched anywhere in the world and is something to be very proud of. So when you hear the problems and troubles of the world, try to step back, focus on positivity and realize how good life is in America and how good the people of America are. Now that we’re here it’s good to know we don’t need to get up in the morning and keep moving. 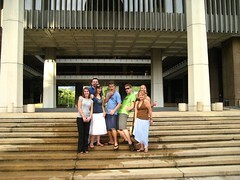 While it’s been great, we’re looking forward to kickin’ back with friends and family in Hawaii. We’ll be hanging out here for a couple weeks now, so let us know if you’re in the area. After that we got no plans, but want to keep traveling and meeting the people of America and the world. Ya'll remember Kim and Mary-Rachel from Raleigh, North Carolina? If not, here they are after taking us to South of the border in Dillon, South Carolina. Assuming we get a ride in the next 12 hours or so, we'll see you in Hawaii tomorrow. Our bay area host, Ty just moved to Cupertino a few months ago, and is lovin’ it. He’s started his own PR company in the south bay area and is working hard to make it happen. Check out his site here and give him a call. Sunday morning we went out for breakfast in Cupertino with Ty and waited for our next ride, Bliss. Bliss may just be the most eccentric person we’ve met. We realized when she showed up wearing blue coveralls with a dashboard covered in rubber reptiles while blasting trashy techno. Her personality came through right away and we knew it would be a fun afternoon. The fun afternoon started right away with the idea of “The Broom Game”. The broom game involves holding a broom above your head, spinning around 30 times, putting the broom down and jumping over it. After The Broom Game we sat down for a bit, said bye to Ty and headed south to Santa Barbara. Bliss is another fan from day one, and holds the record for most emails sent to us. I'm gonna guess about 120. She's also a grad student in Santa Barbara, on her way back south after Thanksgiving. She's a proud Vermont girl caught out in California, counting the days until she can get back east. Bliss entertained us by missing exits, screaming randomly at cars, eating food which gives her stomach aches, complaining about traffic while in traffic, asking real random questions, texting us from 20 feet away and taking us to the outlet shops. Here she is caught in her car door. 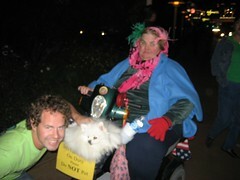 We stopped in Santa Barbara to see some of Bliss' friends before continuing south to the Los Angeles area. Regardless of what happens Monday during the day, Monday night is the Hitch50, Day 49 party here in Simi Valley. We're having a big event put on by the band Fermata to try and find us a way to Hawaii, so come on out, hang out and have some fun. We came back into Reno and searched for some dinner. Dinner came in the form of the biggest buffet we’ve ever seen. It was an entire banquet hall with one whole wall full of every kind of meat, vegetable and starch possible. Throughout the room were salad and dessert table scattered in every direction. We couldn’t possibly leave Nevada without tackling the 100 yard buffet. Don’t worry though, Sean kept to his diet. After the rest of us gained several pounds, it was back on the road and off to California. On the way to Sacramento we finally got our first speeding ticket of the trip. It took almost 21,000 miles but we’re thankful it finally happened. 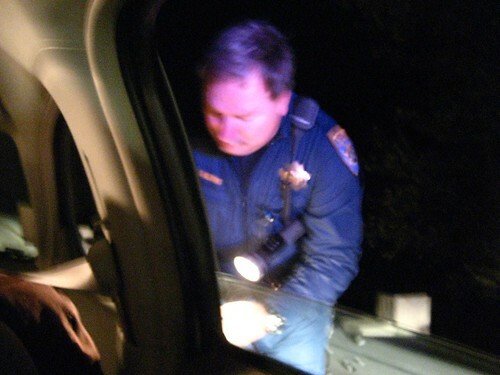 Yeah, thankful for a ticket, no road trip would be complete without it. 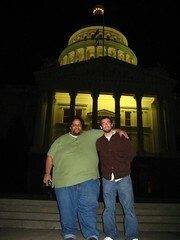 Sean and Aaron took us into Sacramento, also known as the city of trees. Apparently Sacramento has the most trees per capita. At the capitol building they have one species of every tree from California somewhere on the capitol grounds, which is pretty cool. 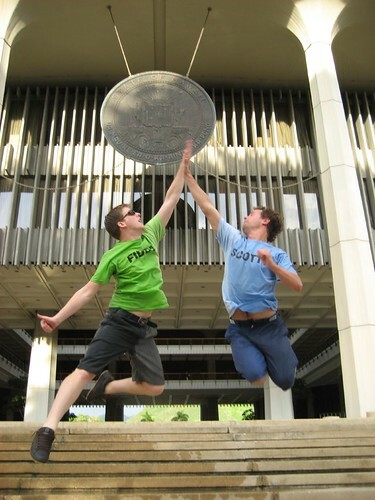 We celebrated this fact with a different jump shot for every species. We're getting pretty good at them by this point of the trip. We dropped off Aaron in Sac-Town and headed for the bay. Sean was going to see some family in Danville, just south of Oakland, but took us south into Cupertino. Ty, a fan from day one had offered us a place to stay and was waiting for us to arrive. We met up, said bye to Sean and started thinking ahead to Hawaii. 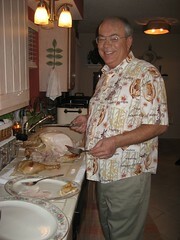 While we were in Phoenix for Thanksgiving Jody was working hard to find us a way to Hawaii. She used to be a reservations agent for America West, so she was workin’ the phones trying to get us some flights to Hawaii or California. She couldn’t line up Hawaii, but her friend Chris did one better with RENO! Falling asleep resulted in the classic Las Vegas miss your flight trick. 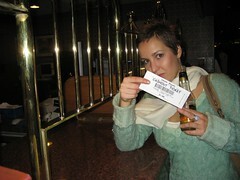 Looking back, it had to be done to get the full Las Vegas experience. We rushed off to the airport in the morning and managed to transfer our tickets to the last two standby seats on a later flight. So, in the end we got to Reno a few hours later, but got a good story out of the deal. Sean and Aaron drove into Reno from Sacramento to meet us. As we walked out of the terminal they were just pulling up. We got in and started the short drive to Nevada’s capital, Carson City. Sean Perkey is easily one of the most interesting people of the trip and is working on a great web project. Sean weights 519 pounds and is working on losing 250 pounds. Check out his blog here: Watchmyloss.com and see how he’s doing or offer him some support, cause it’s one of the more awesome projects ever. We cruised into the Carson City, got some photos, realized not too much was going on in town and headed back towards Reno. 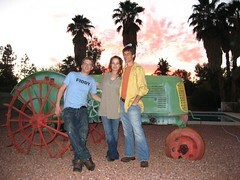 Our original plans were to catch a ride with Jody to Flagstaff, then hitch to the Grand Canyon and Las Vegas. This leg of the trip got a whole bunch easier and better after meeting Katerina, Jody’s intern in Phoenix. She was keen to go on a road trip and offered a ride to Las Vegas. Jody allowed her to take her final two days off work and we were on our way. Katerina, a vegitarian, who is originally from Bulgaria, and has been in Arizona for about six years. She’s working to get two degrees in Tourism and Fine Arts at ASU in Phoenix. She’s been Jody’s intern for the past couple months working with her on developing and promoting Jody’s new album. We cruised through the town of Sedona on the way to Flagstaff. Apparently the area is a gathering place for mystics who believe the earth's energy is concentrated into power spots some call vortices. This means the area is a giant energy vortex, which is good for healing purposes. Whether you believe that or not, the area is definitely worth a look and a popular tourist destination. It was a good thing we took a sidetrack through Sedona because it became apparent we weren’t gonna make the Grand Canyon before dark, and it was fogged in. We needed to make the decision: roll the dice on seeing the Grand Canyon, thereby getting into Vegas late at night, or scratch the canyon and focus on one night in Vegas. We went with option number two and sped off to Vegas. On the way into Vegas we got in our first, and hopefully last car accident of the trip. But, don’t worry it was about as minor as an accident can be. Scotty was driving Katerina’s car coming into Vegas on the freeway when the cars in front slammed on their brakes. We went from about 70 MPH to 0 in about 100 feet, skidding, tires smoking, horn blaring to a stop in the middle of the freeway. The final stop came with the tap of the person’s bumper ahead of us. A very close call, no damage done, but a good story. It was Thanksgiving weekend, so almost everything in Vegas was either booked or expensive, so we stayed at the lovely High Hat Regency, not to be confused with the Hyatt Regency. Welcoming us to our room were cigarette butts, mold and broken glass on the floor. We didn’t even want to think about what’s gone on in that room, so we hit the town. It was just one night in Vegas so we needed to get it all in. We toured the strip, checked out several casinos, met lots of people and only lost $50 in the process. I was told to put $50 on red so I did. When the wheel stopped it was on double zero. We had originally planned to get an early start on Thursday and make it out of town, towards Las Vegas for Thanksgiving. However, by the time we were ready to get going it was mid-afternoon. So, this gave us perfect reason to stay in Phoenix and hang out with everyone there for another night. Plus, Richard and Carol Gnant, Jody’s parents invited us for an all American Thanksgiving dinner, which we couldn’t pass up. Richard and Carol, like so many Arizona residents, are not from Arizona. They moved down from Wisconsin for the weather, and are lovin’ the desert lifestyle. 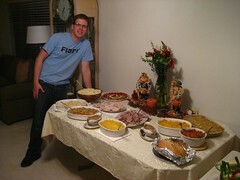 We accompanied about 15 people from Jody's family for the harvest feast. All of them were overly welcoming and we were all thankful to be together. Richard even gave us a big shout out while saying grace. After an amazing dinner prepared by many amazing cooks, the turkey caught up to us and we were down for the count. Jody’s mom kept us all going with her humor, some of which caught us off guard. Didn’t think many grandmas out there were as funny as her, and it has definitely rubbed off on the rest of the family. From young to old we all hung out around their house talking, laughing and of course eating for the night. We rolled into Phoenix just after sunset and made our way to the capitol building. Waiting to meet us was Katie, Jody and Scott. 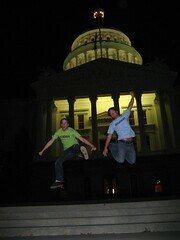 They were all following our progress and came down to get some capitol building jump shots. We got the shots, but there were no stairs so we needed to improvise. 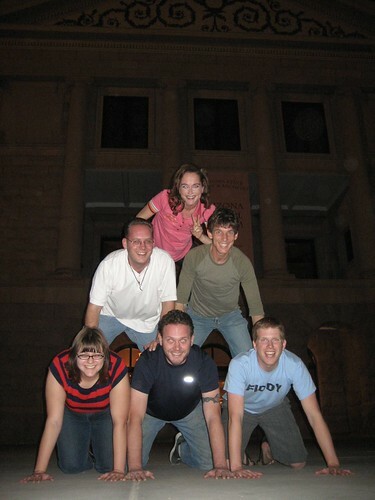 Improvisation came in the form of a good ole' fashioned human pyramid. It was Jody’s first experience at the top of a pyramid and she was overly excited about it for the next several hours. And for good reason. Jody’s friend Leslie invited us all to come to Alice Cooper’s restaurant, Cooperstown in downtown Phoenix for dinner. Another offer not to be passed by, so we said bye to John and Mike then went for dinner. On top of hooking everyone up with free food and drinks Leslie gave us a tour of ‘The Dungeon’, Alice Cooper’s private lounge underneath the restaurant. Jody and Scott set us up with a place to stay in downtown Phoenix for the night, so we headed off with them. Leslie and Katerina, Jody’s intern came over with us to get down for the night. By get down, I mean rock out with the several instruments Jody and Scott own. We got down with the trumpet, accordion, piano and guitar while Jody sang. 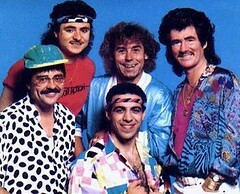 You may want to note, except for Jody, none of us can play any of these instruments. Jody and Scott are such hospitable hosts and a lot of fun too. We were joking around, playing games and laughing the whole time in Phoenix. They didn't even get too upset when I invited a couple people from the street to come join our party, even though one of them was really sketchy. Sorry about that guys. Jody recently quit her job and focused on being a singer. She is in the process of finalizing her album called Pivot, check out her web site here and have a listen. Or better yet, go see a movie anytime between now and the end of December, but go a few minutes before the show starts. Jody’s video for her new single “Hounds of Romance” is featured in all the Harkins’ movie theaters around the country before every film is shown. Scott is a furniture designer and manufacturer. Their home is beautifully decorated with the diverse and stylin’ pieces he makes. Both Jody and Scott’s creativity is abundant in everything they do, and makes hanging around with them just that much more interesting. 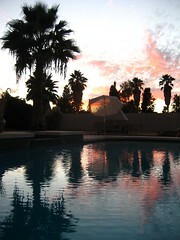 We hung out, laughed and watched Jody perform late into the night in their Phoenix home. If you're planning on traveling around make sure you're keeping track of your current accounts. It's easy to burn through money, especially when you're having fun. 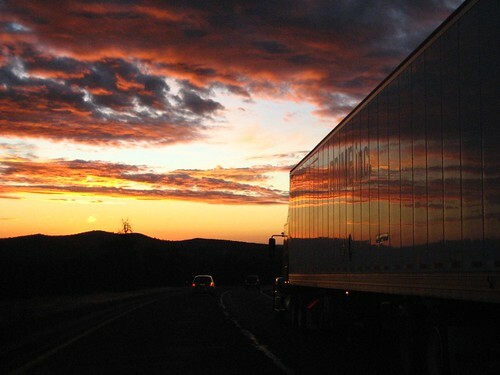 Learn how to manage your accounts and be frugal on the road.